Arguably no one can claim that he or she speaks more for the Turkish conscience than Orhan Pamuk, the only Turk to win the Nobel Prize for literature. “The electoral defeat enraged Erdogan,” Pamuk told the daily, arguing that the setback, which resulted in new elections being scheduled for November 1, was also behind the recent resumption of hostilities between the army and Kurdish militants. The country now finds itself even more divided in the wake of a terrorist bombing that has now killed more than 100 people, the deadliest such attack in the history of the modern Turkish republic. The Ankara attack and its political fallout are now set to dominate the last 19 days of the election campaign, and it augurs the possibility of ominous threat to Turkish democracy. Erdoğan, elected president two years ago and whose Adalet ve Kalkınma Partisi (AKP, the Justice and Development Party) rose to power initially in 2002, has not yet delivered more than a short statement in response to the bombing. Prime minister Ahmet Davutoğlu’s remarks Saturday initially blamed ISIS/ISIL/Islamic State, Kurdish nationalists or left-wing activists for the attack, though the government says it now believes, on the basis of hard evidence, that the Islamic State is behind the bombings. The attack is similar to a suicide bombing in the southern border town of Suruç that killed 33 people in July — and that set Turkish armed forces in action against Islamic State. Nevertheless, ISIS militants, who are never incredibly bashful about such attacks, have not taken credit for the bombings. 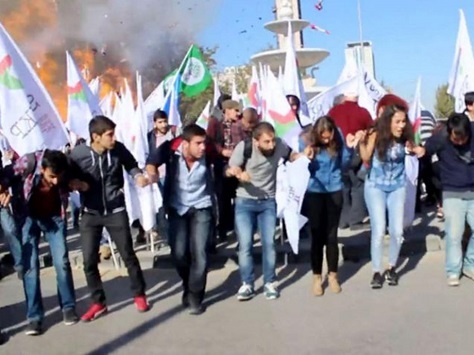 The Suruç attack also brought angry reprisals from Kurdish militants against Turkish police and military personnel. Erdoğan responded by escalating tensions, thereby bringing to an end a years-long ceasefire with the Partiya Karkerên Kurdistanê (PKK, Kurdistan Workers’ Party), an armed Marxist group that has intermittently fought the Turkish military since the 1980s. Until this summer, greater cultural autonomy and political freedom for Turkey’s Kurdish population, and a growing sense of security and peace under the mutual ceasefire, had been one of Erdoğan’s most crucial legacies. Unable to form a governing coalition with any of Turkey’s opposition parties after more than a decade of one-party rule, Turkish president Recep Tayyip Erdoğan’s strategy for scrambling politics prior to the country’s return to polls on November 1 is becoming increasingly clear, and it’s a cynical maneuver that could ruin one of Erdoğan’s most important legacies. What’s clear is that Erdoğan and his chief lieutenant, prime minister and former foreign minister Ahmet Davutoğlu are determined to take back their majority in the 550-seat Türkiye Büyük Millet Meclisi (Grand National Assembly), even if it means bending the rules of traditional democracy. With each passing day, the Turkish military’s intensifying engagement both against the Islamic State/ISIS and Kurdish militants within the Partiya Karkerên Kurdistanê (PKK, Kurdistan Workers’ Party) seem designed to shake up Turkish politics enough for the Adalet ve Kalkınma Partisi (AKP, the Justice and Development Party) to return to power without resorting to a governing coalition. 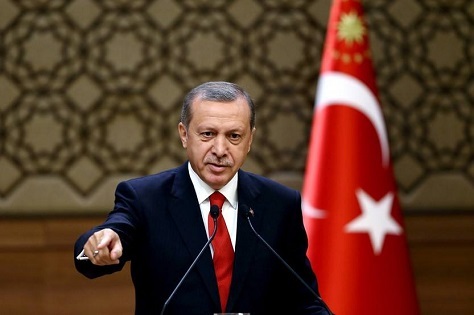 While there were already worrying signs that Erdoğan was attempting to harass Turkish media in the lead-up to the June campaign, he now seems to be going even farther by arresting and raiding the most critical voices in the press. As Erdoğan’s push against Kurdish militants increases, he has openly discussed persecuting all Kurdish politicians, even those with few ties to the PKK. 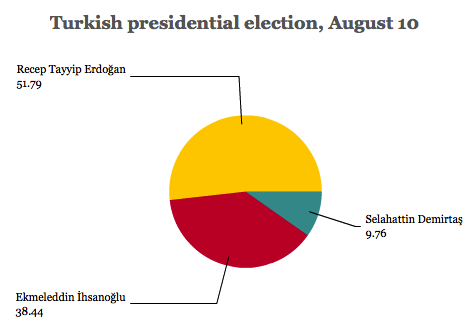 To understand what’s going on requires an understanding of the arithmetic of Turkish politics, especially because many polls show that voter preferences haven’t particularly changed since June. He’s 42 years old, socialist, Kurdish, a native Zaza speaker and an Ankara-trained attorney who encourages gentle outreach to the Armenian diaspora and champions the cause of LGBT rights in a conservative country with a 12-year Islamist government. Nevertheless, Selahattin Demirtaş is well on his way to becoming the most potent opposition leader in the 12 years since Recep Tayyip Erdoğan came to national power in Turkey. Notwithstanding grumbling about Erdoğan’s Islamism, authoritarianism, presidentialism or Turkey’s wilting economy, Erdoğan remains the most important figure in Turkish politics since Mustafa Kemal Atatürk, the military officer who essentially founded the modern state of Turkey as a secular, democratic(ish) republic in the 1920s and 1930s. Enter Demirtaş, a virtual political pop star, who challenged Erdoğan for the presidency last year and won 9.8% of the vote. 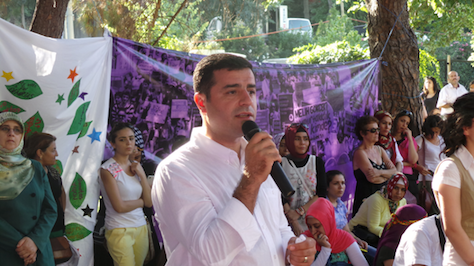 Since the August 2014 presidential campaign, Demirtaş has only become more popular, and he hopes that Sunday’s election will mark a breakthrough performance for his party, the Halkların Demokratik Partisi (HDP, People’s Democratic Party), a merger of several left-wing groups and the Kurdish Democratic Regions Party. 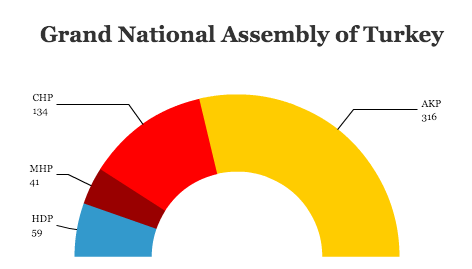 If he succeeds, the HDP will be the first pan-Kurdish party to clear the 10% electoral threshold to win seats in the Türkiye Büyük Millet Meclisi (Grand National Assembly). 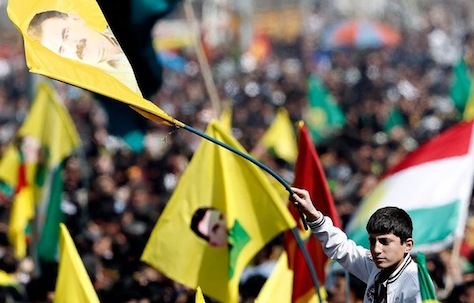 In the past, candidates from Kurdish parties have run as independents. This time around, Demirtaş is betting that he can achieve the 10% support that would double Kurdish representation in the Turkish parliament. Polls show that it will win anywhere from 8% to 13% in the June 7 elections and, provided it meets the 10% electoral threshold, between 57 and 72 seats in the Grand National Assembly, though most observers believe the HDP will skew even higher than polls capture. On the campaign trail, Demirtaş has championed a leftist agenda not atypical for a social democratic party across Europe — a call for a rise in the minimum wage, calls for national unity and respect for all Turks and, most astoundingly, greater rights for Turkey’s LGBT population — not the easiest sell in the conservative, Islamic country of 77 million. 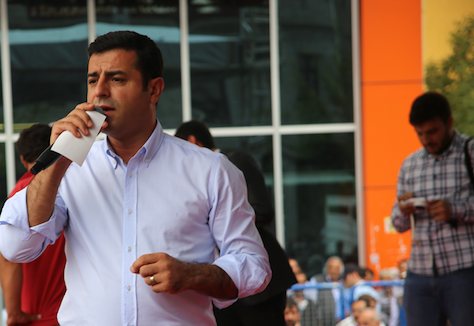 Though he’s emerged as the star of the 2015 campaign season, he points out that he’s only the co-chair of the HDP. Like Germany’s Green Party, for example, Demirtaş serves alongside Figen Yüksekdağ, a female activist from the socialist wing of the HDP. 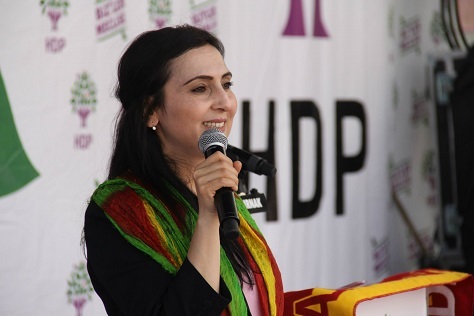 Yüksekdağ (pictured above) founded in 2010 the ‘Socialist Party of the Oppressed’ and joined forces with the HDP in 2014, and brings to the HDP campaign an emphasis on feminism and the kind of leftist economic policy that wouldn’t be out of place at a SYRIZA rally in Greece or a Podemos rally in Spain. Though she’s not as flashy as her co-chair, she provides greater depth to the HDP, which could transcend the Kurdish electorate and appeal to the wider circle of Turkish liberals. After a century of being treated like second-class citizens in their own country, Turkish Kurds must wonder with astonishment how they have become increasingly in the span of less than a decade one of the most important swing groups in Turkish politics. Ultimately, neither Gulenists nor Kemalists nor anyone else could stand in the way of Turkish prime minister Recep Tayyip Erdoğan in his quest to become Turkey’s first directly elected president. 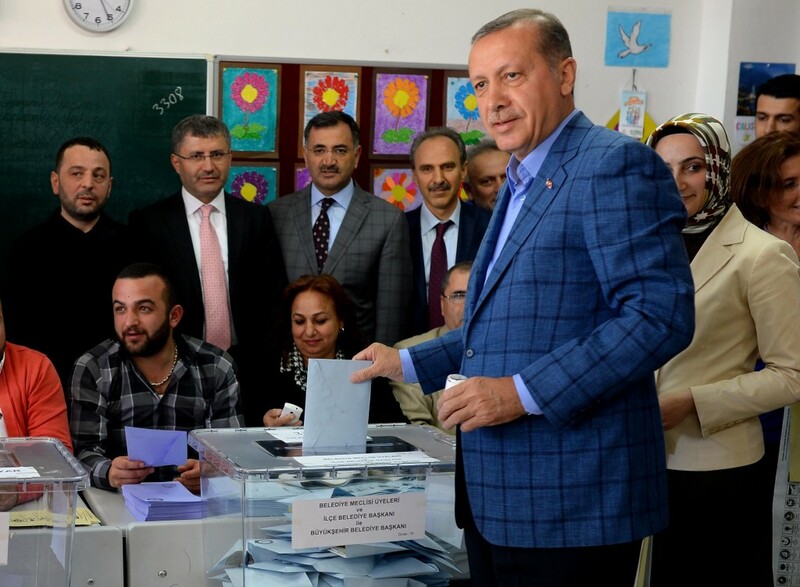 But his victory in yesterday’s presidential election wasn’t exactly surprising — the only question was whether Erdoğan (pictured above) would win the presidency outright on August 10 or whether he would advance to a potential August 24 runoff against the second-place challenger, former diplomat Ekmeleddin İhsanoğlu. Though the election’s outcome wasn’t really in doubt, Erdoğan’s future and the direction of Turkey’s political structure remain much cloudier. 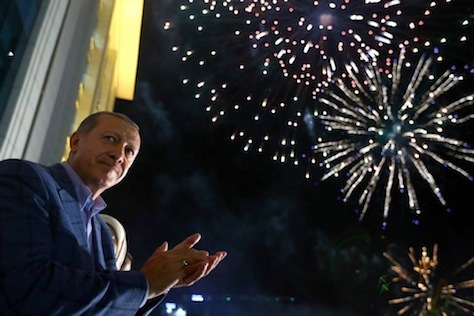 Vowing a ‘new era’ in his victory speech, Erdoğan’s ambition to remain the most powerful figure in Turkish politics is hardly a secret, even though the presidency has been a ceremonial office since the 1961 constitution. That means his presidential victory now presents at least three difficult questions for which we won’t have answers anytime soon. 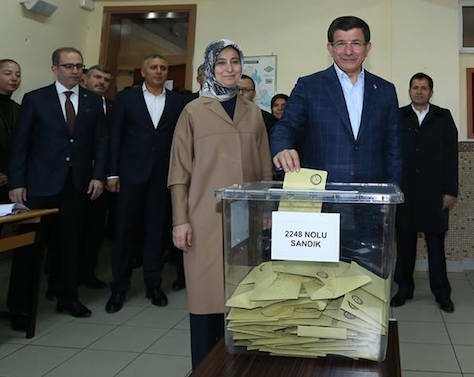 first direct Turkish presidential election? Can Erdogan be stopped in first direct Turkish presidential election? 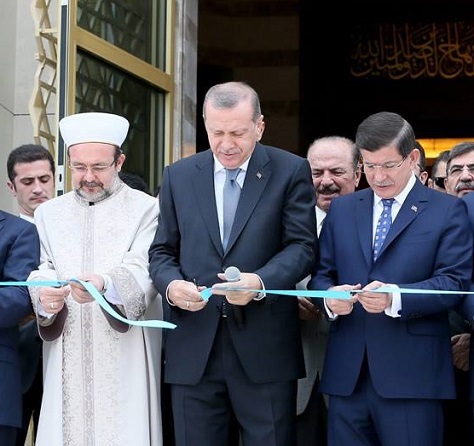 You’ve probably never seen Turkish prime minister Recep Tayyip Erdoğan like this before. In his bid to win Turkey’s first-ever direct presidential election, he donned bright orange athletic gear (pictured above) and took to the football field at a new stadium in Istanbul earlier this week, scoring a hat trick against token opposition. Though that may replicate Erdoğan’s seemingly unstoppable rise, leading his governing Adalet ve Kalkınma Partisi (AKP, the Justice and Development Party) to victory three consecutive times — in 2002, 2007 and 2011 — his latest electoral quest may prove more difficult. Turkish voters will elect a president in voting scheduled for August 10 among Erdoğan and two challengers, Ekmeleddin İhsanoğlu and Selahattin Demirtaş. If none of the candidates win more than 50% of the vote, the top two candidate will advance to an August 24 runoff. 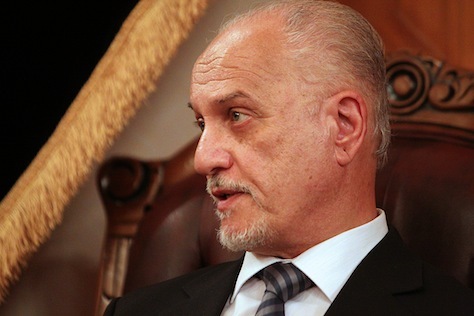 The Cairo-born İhsanoğlu (pictured above), who served as the secretary-general of the Organisation of Islamic Cooperation between 2004 and January 2014, is an academic with a background in, of all things, the history of science. 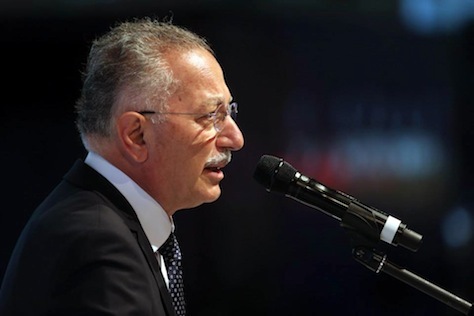 An independent by party and a conservative by temperament, İhsanoğlu was nominated for the presidency by an alliance of two very different opposition groups pushed together by a mutual opposition to Erdoğan: the center-left Cumhuriyet Halk Partisi (CHP, the Republican People’s Party), most associated with Kemalism in the pre-Erdoğan era, and the ultranationalist, conservative Milliyetçi Hareket Partisi (MHP, Nationalist Movement Party). 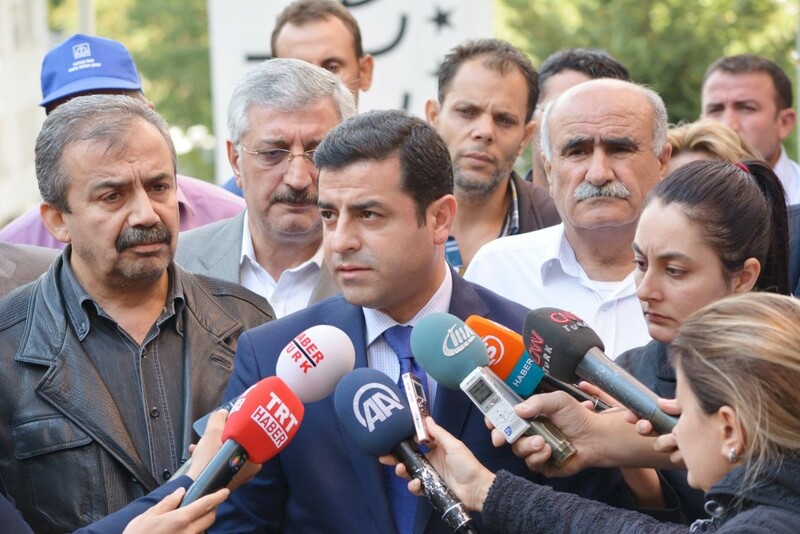 Demirtaş (pictured above), a 41-year old rising star popular among Turkish leftists, is the candidate of the Kurdish-interest Barış ve Demokrasi Partisi (BDP, Peace and Democracy Party), though he hopes to win support from among the CHP’s more liberal supporters. Defying decades of repressive precedent, Erdoğan has tried to pacify relations between the central government and Turkey’s Kurdish minority, and he’s increasingly made Turkey an improbable ally of the de facto independent Iraqi Kurdistan. That’s won Erdoğan genuine respect among Kurdish voters, though many will undoubtedly support Demirtaş in the election’s first round. It will nonetheless be something of a curiosity if Erdoğan is forced into a runoff, but makes it over the top on the basis of Kurdish votes. If İhsanoğlu wins, he will become, like many of his predecessors, a figurehead with ceremonial powers and little else. With US and Iranian officials publicly pressuring Iraq’s parliament to form a new national unity government as quickly as possible, Sunni and Kurdish (and, increasingly, many Shiite) leaders seem united on one thing — they’re not enthusiastic about giving Iraqi prime minister Nouri al-Maliki a third term in office. Iraq’s parliamentarians took a small step toward forming a new government yesterday when they elected Salim al-Jubouri as the new speaker of the 328-member Council of Representatives (مجلس النواب العراقي‎). In post-Saddam Iraq, the speakership is reserved for a Sunni, the presidency is reserved for a Kurd, and the premiership for a Shiite. Each official has two deputies such that each group — Sunni, Shiite and Kurdish — winds up with one major office and two deputy offices. Accordingly, when the Iraqi parliament chose Jubouri as the speaker, it also chose his two deputies. It was the vote to appoint Iraq’s Shiite deputy speaker, however, that may hold some clues to the rest of the government formation process. The new speaker has fully two weeks to nominate a candidate for the Iraqi presidency, which means it could take a full month to appoint the president who thereupon has another 15 days to appoint a prime minister. Though Haidar al-Abadi, a Maliki ally, ultimately won the deputy speakership, he faced an unexpectedly stiff challenge from Ahmad Chalabi, who’s gunning for the premiership. There’s been a considerable amount of chatter inside and Iraq about the sudden rehabilitation of Chalabi, a figure upon whom US officials relied heavily in their decision to launch a military invasion against Saddam Hussein in 2003. But for all the talk of his sudden rise, he remains a longshot to become Iraq’s next prime minister. All the same, Abadi’s rise also signals that Maliki won’t continue as Iraq’s prime minister, either. Abadi is not only a member of Maliki’s State of Law Coalition (إئتلاف دولة القانون), he’s a member of Maliki’s party, Islamic Dawa (حزب الدعوة الإسلامية‎). In April’s parliamentary elections, which now seem a lifetime ago in Iraqi politics, Maliki’s State of Law Coalition (SLC) won 92 seats, by far the largest bloc in the parliament, itself holding a majority within the Shiite majority. Though , the State of Law Coalition will continue to drive the process within the Shiite bloc, generally, it’s farfetched to think that other SLC leaders, not to mention the legislators of the two other Shiite groups, Muqtada al-Sadr’s Sadrist Movement (التيار الصدري) and Ammar al-Hakim’s Islamic Supreme Council of Iraq (ICSI, المجلس الأعلى الإسلامي العراقي‎), would agree to hand over two of the three top offices, including the premiership to Islamic Dawa. At first glance, Turkey’s local elections on Sunday seem like a huge victory for prime minister Recep Tayyip Erdoğan (pictured above). His party, the Adalet ve Kalkınma Partisi (AKP, the Justice and Development Party), which has governed Turkey since 2002, had an impressive day, notwithstanding the protests last summer that seemed to weaken Erdoğan’s grip on power, and corruption scandals that led to the resignation of four ministers in Erdoğan’s government late last year. With nearly all of the votes counted, the AKP won 44.18% of the nationwide vote — that’s even more than the 39% it won in the most recent 2009 local elections. Far behind in second place was the center-left, ‘Kemalist’ Cumhuriyet Halk Partisi (CHP, the Republican People’s Party), with just 26.15%. 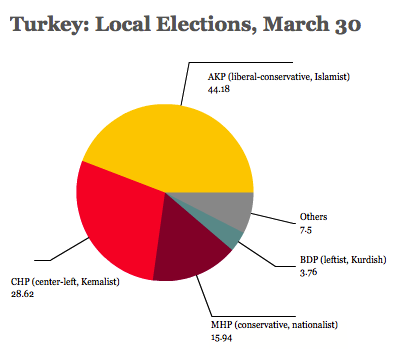 Though the CHP (light red) is still a strong force in Turkey’s major cities and along its western coast, and although the BDP (blue) thrives in Kurdish-majority areas, the wide swath of yellow demonstrates that Turkey is still AKP country. Even more impressively, the AKP appears to have won the mayoral contests in both Istanbul, Turkey’s largest city, and Ankara, its capital. Kadir Topbaş, who has served as Istanbul’s mayor since 2004, narrowly won a third term against CHP challenger Mustafa Sarıgül, the longtime mayor of Istabul’s Şişli district, by a margin of 47.85% to 39.93%. Though there are reports of electricity blackouts during the vote-counting and other minor irregularities, Sarıgül has conceded defeat. 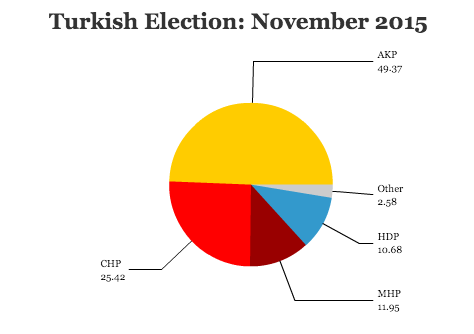 In Ankara, however, the race is still too close to call. The AKP’s Melih Gökçek, who has been Ankara’s mayor since 1994, officially won 44.64%, while CHP challenger Mansur Yavaş won 43.92%. Both candidates have declared victory, and Yavaş has alleged ballot fraud. 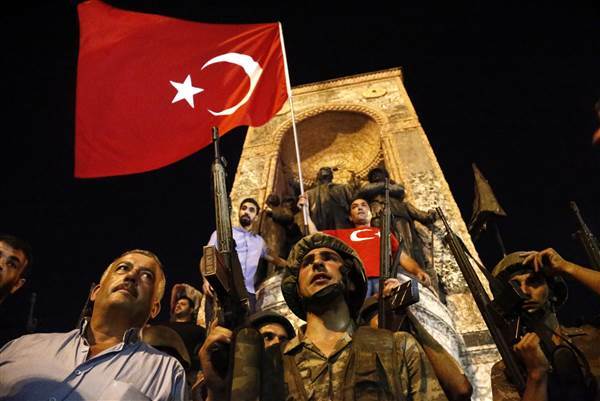 The CHP will appeal the result in what could be a protracted fight over control of the Turkish capital. But the real fight was never between the AKP and the CHP, and though Erdoğan defiantly claimed victory in a balcony rant Sunday night, threatening vengeance on his enemies, other forces within his coalition will determine whether Erdoğan will be a candidate in Turkey’s first direct presidential election in August, and whether Erdoğan (or another AKP leader) will lead the party into its bid for a fourth consecutive term in government in parliamentary elections that must be held before June 2015. Retired U.S. colonel Ted Spain lists 10 mistakes that the United States made in its Iraq invasion in March 2003 in a succinct and insightful piece in Foreign Policy today. Virtually all of them — from the intelligence failures to the inability or incapacity to provide for post-invasion law and order to the flippant attitude of the U.S. to building diplomatic ties in advance of the invasion — have to do with inadequate pre-war planning. 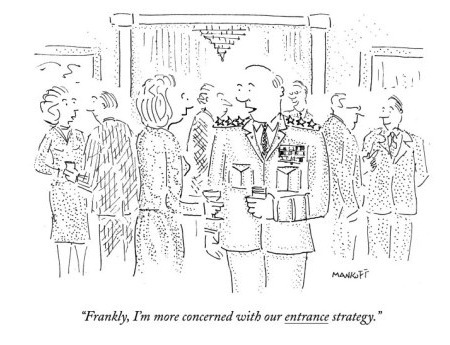 It reminded me of a cartoon that a friend rediscovered from The New Yorker over the weekend (pictured above), a poignant commentary on just how much hubris American policymakers, chief among them the Pentagon strategists under the leadership of U.S. Donald Rumsfeld, displayed in March 2003 before the Iraqi invasion. It’s unclear today that the United States or the Middle East is more secure for having removed Saddam Hussein from power. Lawrence B. Lindsey, at the time head of U.S. president George W. Bush’s national economic counsel, was essentially sacked for suggesting that the war might cost up to $200 billion. It ended up costing $800 billion, nearly 4,500 U.S. troop deaths, 32,000 wounded and today, the U.S. military doesn’t even have so much as a small outpost in Baghdad since the absolute withdrawal of U.S. forces in December 2011. Furthermore, the horrific prisoner abuse scandal at Abu Ghraib cost the United States whatever moral legitimacy it still had left a year after the invasion, which morphed from a quest to rid the country of phantom weapons of mass destruction into an aimless occupation to develop a democratic Iraq into a darker, counterinsurgency effort to stop a painful sectarian civil war. And that’s even if you believe that the faulty intelligence that led U.S. political leaders to believe that Iraq was harboring weapons of mass destruction (it wasn’t — Saddam was posturing in large part to posture vis-a-vis Iran) was merely gross negligence and not outright manipulation and fraud. Saddam was certainly no angel — and with the civil war in neighboring Syria reaching nearly a two-year anniversary under strongman Bashar al-Assad, the two countries provide quite a damning indictment for the Ba’ath Party (حزب البعث العربي الاشتراكي) in the two countries where it has been the dominant party in the last half of the 20th century. But it’s certainly clear that Iraq is no better off for having suffered through the invasion and its aftermath. Iraq today is, mercifully, a long way from the sectarian violence that marred in the civil war from 2005 to 2008 but today, clear strains exist among the Sunni, Shi’a and Kurdish Iraqis. Millions of Iraqi citizens were either displaced in the sectarian violence or fled the country entirely, and an estimated 120,000 Iraqi citizens were killed in the fighting. 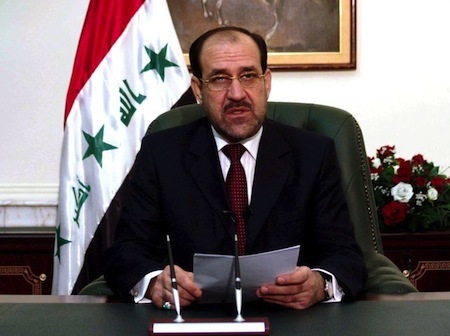 Iraqi prime minister Nuri al-Maliki (نوري المالكي) (pictured above), who leads a Shi’ite coalition in the Iraqi parliament, is hardly a secular democratic leader, and protests have increasingly opposed his government in recent months — despite a 50% increase in Iraqi oil production since taking power in 2006, Sunnis in Baghdad now stridently oppose the al-Maliki government. The Iraqi parliament passed a law earlier this year limiting the speaker of the Iraqi parliament and Iraq’s prime minister and president to just two terms in office — that means al-Maliki will not govern Iraq after expected parliamentary elections in March 2014. Those elections, by the way, will occur just months before another war-torn country in which the United States still has troops, Afghanistan, is set to select a successor to the term-limited president Hamid Karzai (حامد کرزی) after 12 years in office. Iraq ranked in 2012 as the ninth-worst failed state in The Fund for Peace’s failed state index. It’s perceived as the world’s 18th most corrupt country in 2012 according to Transparency International. Though it’s made many gains in the past five years, it still ranks as just 131 out of 186 in the United Nations Human Development Report for 2013. An estimated 120,000 Iraqi citizens died. You can’t place the blame for all of those deaths directly on the U.S. military or the Bush administration or Donald Rumsfeld. But it’s indisputable that the invasion that the United States launched 10 years ago this week led to the unraveling of Iraqi civil society that unleashed the violence that led to those deaths. If there’s one overweening lesson that the next generation of American security experts take away from the Iraqi war, whatever strides or obstacles that Iraq faces in the decades ahead, it’s that inadequate planning can doom even the most flawless initial invasion into a decade of painful, costly and terror-filled destabilization. Thanks to Timothy Stewart-Winter for the cartoon by Robert Mankoff, which ran in The New Yorker in 2003.